Do Your Facebook Posts Generate Revenue? If you don’t know if your Facebook posts are creating a return, you might want to find out! Posts to your Facebook page are great, they’re free and can get traffic right to your site. However, this kind of frequent posting takes time and effort. But what is the return? How do you know if your Facebook page promotions are bringing in sales or leads? Using Google Analytics you can see social traffic and tell which social platform it came from. When you look at your facebook traffic, you don’t know if it comes from someone sharing a link, your page posts or the web address on your Facebook page. Facebook insights will tell you how many clicks you got on your posts, but that’s where the information dries up. You can’t tell which posts genuinely increase sales or leads and which ones create traffic that leave your site just as fast as it arrived. Tracking Facebook Posts Can Be Done! Lets say I’d like to promote our audit page. I start by putting the link to that page in the URL Builder tool. Next I’ll fill in all the mandatory fields. I’m going to call my source “facebook” because that’s where the traffic will come from. Medium I’ll label as “page post” to differentiate from my facebook advertising. Campaign Name I’ll call “audit” because that’s what I’m promoting. You can fill in other fields if you want to get very granular, but for this example the mandatory fields will do. 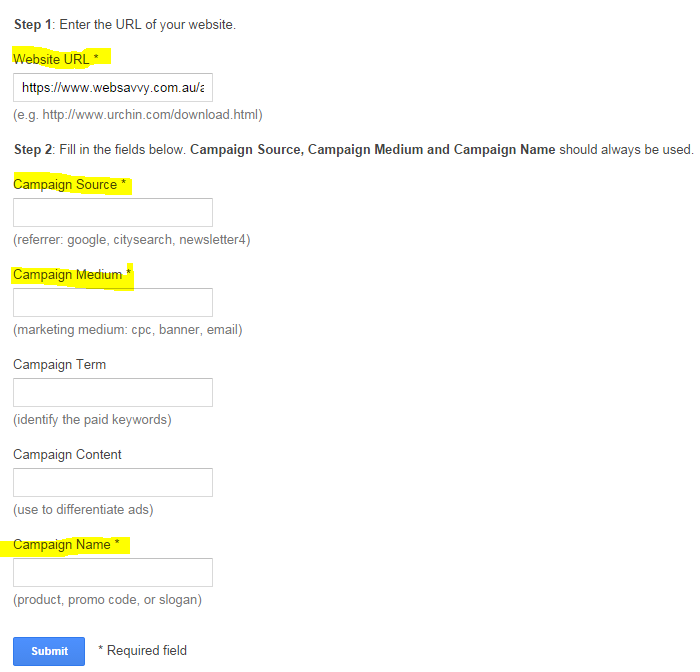 Once my post has generated some traffic I can go to Google Analytics and select “Acquisition” and “campaigns”. Changing the “primary destination” will let you see how the traffic from Facebook posts use the site. But I’m getting ahead of myself. Putting a link that looks like a website followed by a bunch of garbage is going to make my post look cluttered and unattractive. The URL shortener goo.gl will also keep track of some other metrics for you. The key thing is that now your facebook posts are nice and clean, and you can find out how much traffic your posts are generating. Are your posts generating revenue or leads? Which posts generate quality traffic and which posts don’t. Should you be spending more time using Facebook as a way to create revenue?